From 27-29 January a Pugwash delegation comprising the Secretary General, Paolo Cotta-Ramusino, Chair of British Pugwash Group, Peter Jenkins, and Pugwash Council Members Götz Neuneck and Alexander Dynkin had a series of meetings in Moscow to discuss the future of arms control as part of a new Pugwash project. 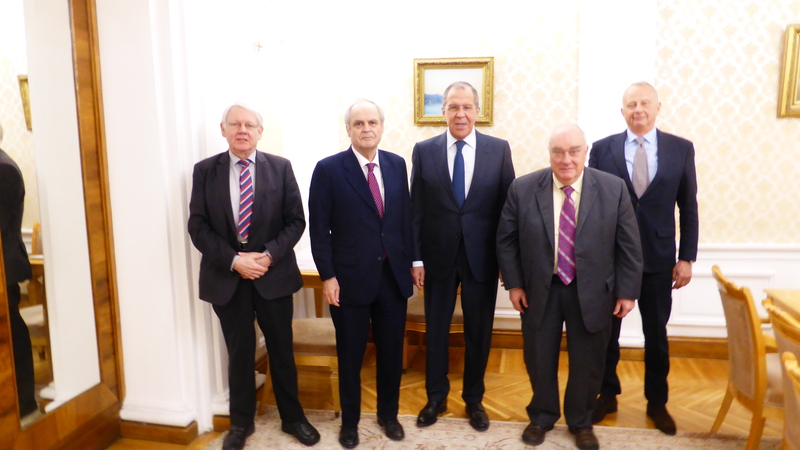 Meetings took place with Russian Minister of Foreign Affairs Sergei Lavrov and Deputy Minister of Foreign Affairs Sergei Ryabkov, as well as a discussion at the Primakov National Research Institute of World Economy and Relations of the Russian Academy of Sciences (IMEMO RAS) with other members of Russian Pugwash. Of particular focus was the Intermediate Nuclear Forces Treaty (INF) and the situation of Russia-US arms control dialogue.